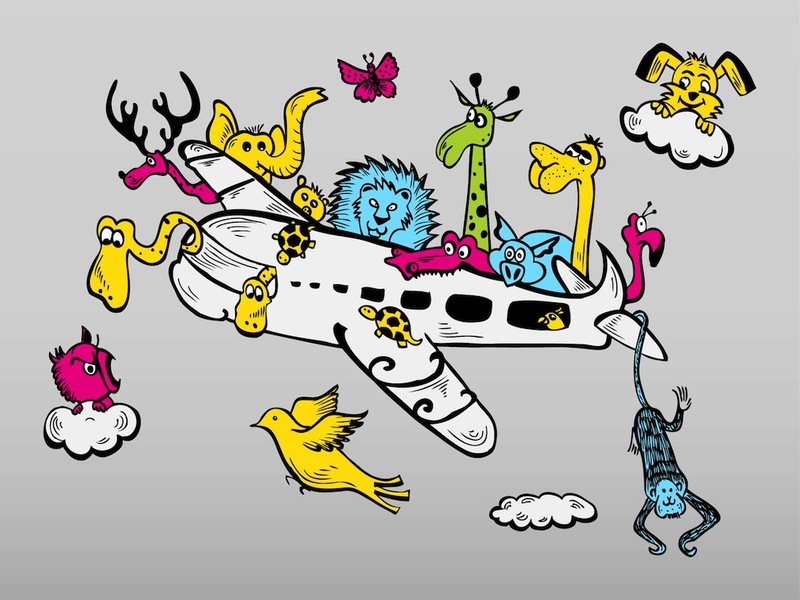 Fun and colorful vector illustration various animals riding on a plane. Funny travel cartoon with elephant, snake, owl, bird, turtle, crocodile, pig, ape, monkey, lion, camel, dog, butterfly and flamingo. Animal sketches pf different fauna species in vivid colors. Crowded plane and fluffy clouds in the sky around it. Free vector caricature illustration for all flying, airplanes, airlines and traveling projects. Funny illustration for clothing prints and posters. Tags: Airplane, Animals, Caricature, Clouds, Colorful, Plane, Sketches.